Readers Questions | Can I Cast Protection Circle Around Candle Spell? Is it necessary to cast a circle for protection to keep unwanted negative energies away before performing a ritual/love spell? Or can I cast a love spell and use my Bible to recite a script like Psalm 23. Sherri, some people use salt as a catalyst to keep away negative energies when burning candles. I found this out when I was interviewing Stan the candle maker, who I featured in a series of interviews recently regarding candles. You might want to look back about a month to read what Stan has to say about ringing salt around candles to keep away negative energies. 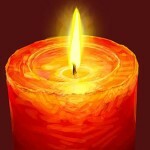 You can contact him at www.wizardcandles.com if you want to find out about using or casting a circle around your candle work.